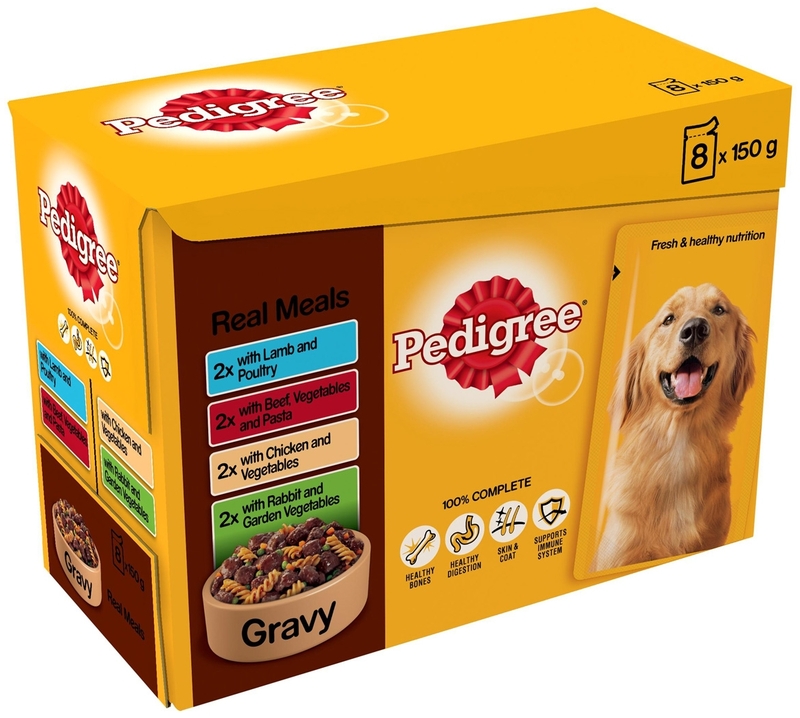 Pedigree Adult Pouches provide your mature dog with all the essential nutrients needed for healthy development, containing a wholesome blend of digestible rice, fish oils (for healthy eyes) and added calcium for dental and skeletal health. The wet pouches are also fortified with natural omega fatty acids, zinc and B vitamins to nourish and protect your dog from the inside out; helping to support digestion and enhancing the condition of its skin and coat. Blended with natural flavours for improved palatability to satisfy even the fussiest appetites. Beef & Vegetables - Meat and Animal Derivatives 30% (including 4% Beef), Vegetables (4% Carrots and Peas), Cereals, Derivatives of Vegetable Origin (0.5% Dried Sugar Beet Pulp), Minerals, Oils and Fats (0.45% Sunflower Oil), Vegetable Protein Extracts. Moisture 80%, Protein 8%, Oils and Fats 5.5%, Fibre 0.4%, Ash 3%, Vitamin D3 150iu/kg, Vitamin E 50mg/kg. Vitamin Levels Guaranteed Until Best Before Date. Total Copper as Copper Sulphate 2.5mg/kg. Colourants. Moisture 81%, Protein 6%, Oils and Fats 4%, Fibre 0.4%, Ash 1.8%, Vitamin D3 150iu/kg, Vitamin E 50mg/kg, Calcium Iodate Anhydrous 0.39mg, Cupric Sulphate Pentahydrate 5.7mg, Ferrous Sulphate Monohydrate 10mg, Manganous Sulphate Monohydrate 5.6mg, Zinc Sulphate Monohydrate 107mg. Vitamin Levels Guaranteed Until Best Before Date. Total Copper as Copper Sulphate 4mg/kg. Colourants. Moisture 80%, Protein 8%, Oils and Fats 5.5%, Fibre 0.4%, Ash 3%. Vitamin D3 150iu/kg. Vitamin E 50mg/kg. Vitamin Levels Guaranteed Until Best Before Date. Total Copper as Copper Sulphate 2.5mg/kg. With Colourants (Permitted EC Additives). 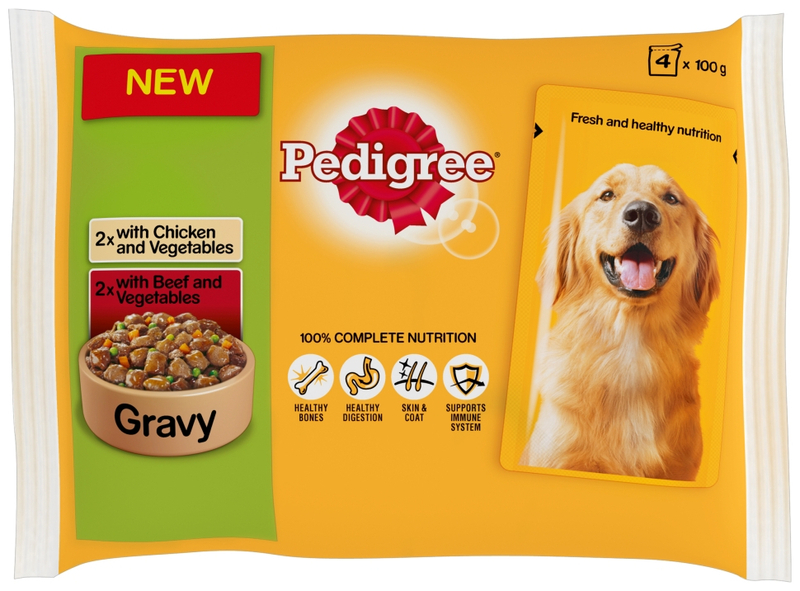 There are currently no questions for Pedigree Adult Dog Food Pouches - be the first to ask one!